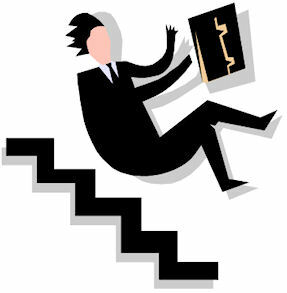 Mr. Market trips over jobs report - bulls left hiding in the cellar? After a week of erratic but decently consolidative action, markets hit a real rough patch on Friday. With comments from Hungary implying the country was at risk of default setting up the market with a negative bias, the Nonfarm Payrolls Report pulled the rug out from under Mr. Market. To give a quick recap, the headline number for May came in at 431,000 whereas expectations were for 500,000. Making matters worse, a full 411,000 of the jobs added for the month came in the form of temporary Census Bureau hirings, a sign that private sector hiring remains weak. A deeper reading of the report shows pressure is very slowly building with hours worked per week, average hourly earnings and temp hiring all showing increases. At some point, it would seem, the employment picture must surely begin to improve. Some employers, however, are shifting part-time workers to full time rather than higher new workers. In other words, companies actually seem to be delaying new hiring as long as possible. The Monster chart shows job offerings accelerating in the first months of 2010 but slowing in May which is pretty much the same result that the NFP report delivered. Still, though improvement in employment seems to be slow in coming, at least we are not seeing a decrease in hiring or jobs being offered. As for the market, decreases in stock prices seem to be the order of the day. A look at some of the numbers we track at Alert HQ may help put things in perspective. This chart shows stocks are very nearly at the dismal levels last seen in March of 2009. The fact that stocks seem to holding at current levels is about all that is positive in this chart. I am usually an optimist so I might interpret that to mean a bottom is forming. That does not necessarily mean stocks are ready to shoot higher. Note that in 2008, it took a couple of months before the moving averages started moving upward from the lows that were established in October and November of that year. At least this chart shows slight improvement which is better than no improvement at all. A slight decrease in downtrends and a small increase in uptrends is certainly welcome but so far isn't enough to remove the bearishness in this chart. The more encouraging aspect is that the number of stocks in downtrends seems to have peaked rather noticeably. This suggests perhaps a period of consolidation on the way rather than a move to lower lows. Most charts are looking pretty horrible and the employment picture is mostly a disappointment. Still, there is reason to think the market can hold at current levels. 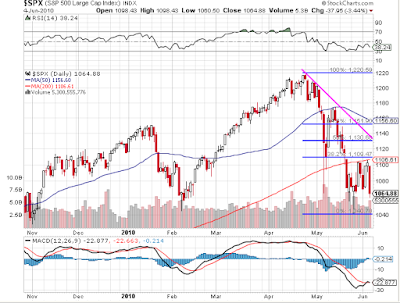 While the S&P 500 keeps failing to move above its 200-DMA it has also managed to stay above the 1040 level. Looking at the chart below, we can see that Fibonacci analysis highlights the importance of the range from 1030 to 1050 as an important support level. Other charts actually look a lot better than that of SPX. The NASDAQ Composite, after spending a week above its 200-DMA fell just barely below it on Friday. And that day's volume on that index was not particularly high at all. The NASDAQ 100 is doing even better, reflecting perhaps, the solid fundamentals in the tech sector. Economic reports should not weigh on the market too heavily this coming week. The Fed Beige Book, retail sales and Michigan Consumer Sentiment are about the biggest hitters. Consumer credit, business and wholesale inventories will have a lesser impact. After Friday's surprise, however, Thursday's initial jobless claims report may take on added importance. In closing, it is clear that markets remain much over-sold and some would say with good reason. 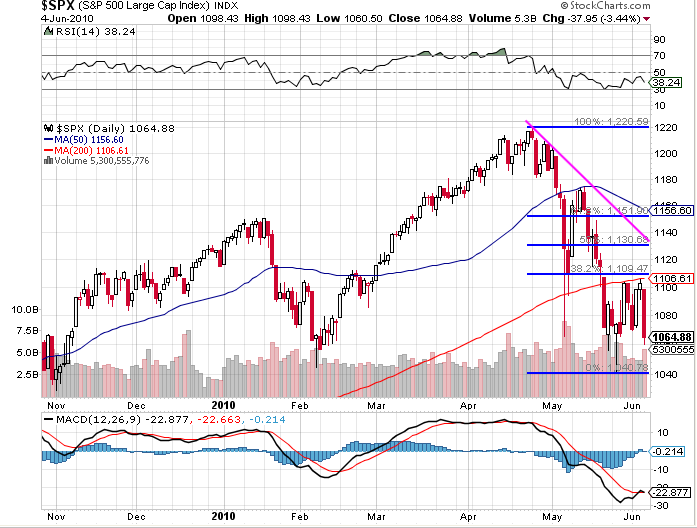 As markets surged after March 2009, the bears declared there would never be a V-shaped recovery. Now that it is clear we are not having a V-shaped recovery, the bears are declaring we must surely be in for a double-dip recession. After what the economy has been through since 2008, why is anyone surprised to see improvement coming in fits and starts rather than in a straight line? In these kinds of times, my advice is as follows: Don't be afraid to be bullish but don't forget to be cautious.